Warm weather is finally here! Old Man Winter died an incredibly annoying slow death and made us realize that under the 100 inches of now-melted snow, there’s an awesome city with tons of rooftops now open for our enjoyment. So when you’re appreciating the many views these bars have to offer, what are you going to wear? Here’s my philosophy on style: It’s your statement to the crowd. Every time you walk into a venue, you’re saying so many things with what you wear before you even open your mouth. If you want those things to be good, spend some time making sure you look great. For guys who may not know how to dress amazingly well, it’ll help to look at some suggestions. Then as you get comfortable, you can mix it up with your own flare. Take the guide below as an example. Dressing for rooftop weather can be tough. When the sun’s out, it can get really warm. But when the sun sets, you feel the wind a lot more and the temperatures drop quickly. For those who will be looking to party before and after sunset, you’ll want something casual, light, and slightly layered. 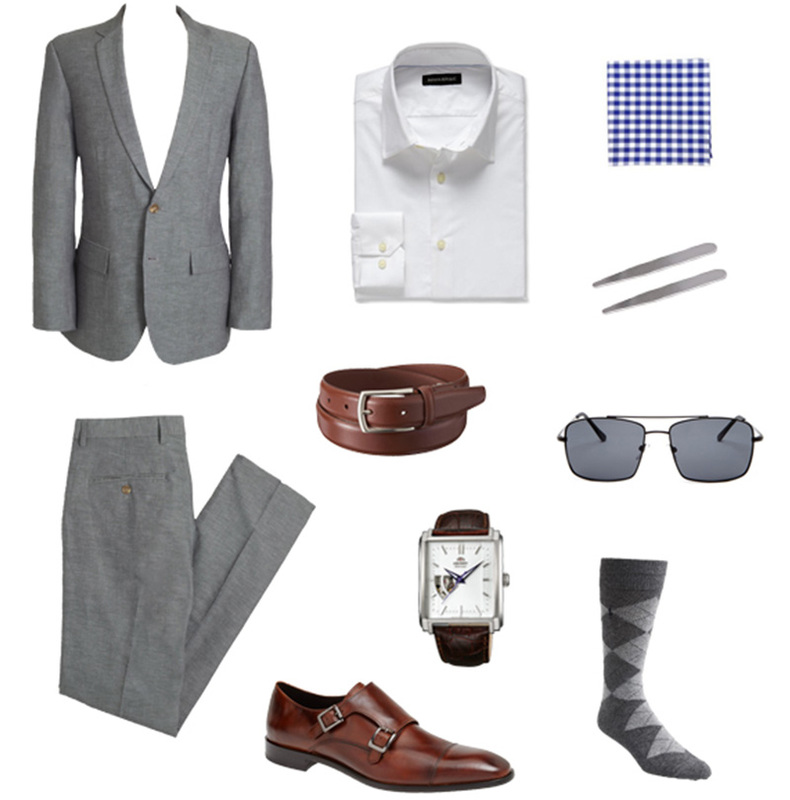 Take this ensemble that dappered.com put together recently. While this was crafted for a more casual wedding, this outfit is great for rooftops, especially if you’re grabbing drinks right after work. The jacket adds a polished light layer that’ll keep you cool while the sun’s out and warm when it goes down. Also, for those who don’t know what to do about colors, the pocket square adds just enough “pop” for people to notice. But here’s where mixing it up can be fun. The pants can make your outfit a little too formal unless you work at a place that requires it. Instead, swap it out with your favorite pair of dark denim jeans. As for the shirt, if you want something a little lighter and more casual, swap that out for a clean button-down collar polo. The button-down in the collar is important with the blazer though, or else you’ll look really sloppy. Don’t be this guy. After that, you can mess around with the other accessories — belt, watch, and even socks — create an outfit that only you could get away with, and look amazing doing it. One thing my clients worry about is people thinking they’re trying too hard. As someone who grew up in Boston, I can say that the majority of people don’t try AT ALL. So for you to make an attempt to look more put together will make you stand out in a great way. And when more women start smiling, approaching, and complimenting you on how you look, you can thank me later. Or you can find me at your favorite rooftop this summer showing you how it’s done.